The Eemsborg had been sitting outside the harbor for several days. I just happened to look out the window and noticed it was getting underway and would be entering the harbor. I jumped in the car and headed down to Canal Park to watch it enter the Ship Canal. Unfortunately the Eemsborg was really moving it out and I arrived just in time to see it sail under the bridge. I tuned the car around and headed for Rice’s Point hopping to get a photo it as it sailed under the Blatnick Bridge. After leaving Observation Park we drove down to Rice’s Point. There were some nice views of the Blatnick Bridge, Midwest Energy Center and Bong Bridge. This past weekend in Duluth the wind was blowing Lake Superior ice onto shore. I spent some time photographing the ice flows. This shot shows the ice being blown into the harbor through the ship canal. The harbor lighthouses are in the background. 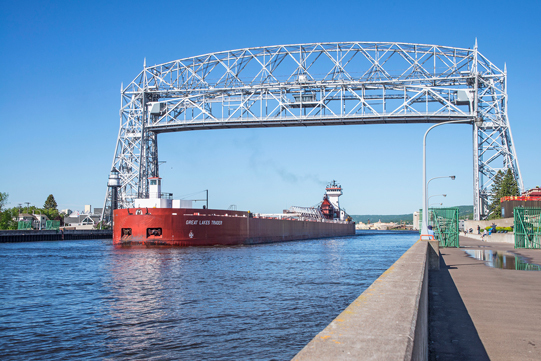 The photo was taken from the Duluth Aerial Lift Bridge. These two shots were taken on the outside of the ship canal where the ice was still frozen in place. This shot was taken from the Arrowhead Bridge at Rice’s Point. 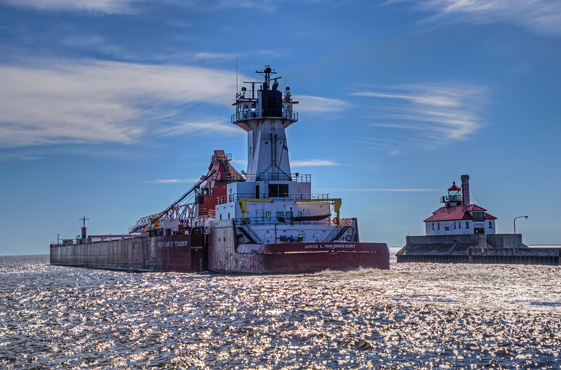 The ice had been broken up by the tugs and ships passing earlier in the day. 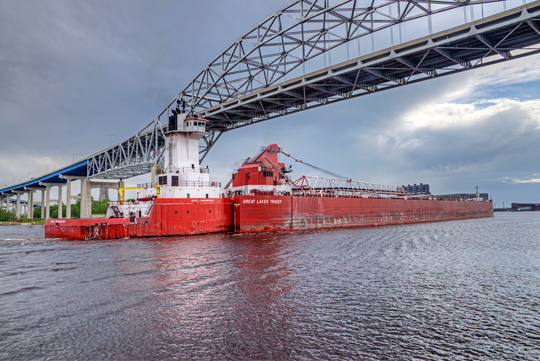 While out photographing ships in layup I walked out to the tip of the Arrowhead Bridge at Rice’s Point in Duluth, Minnesota. On the way back I took a few photos of the historic bridge. 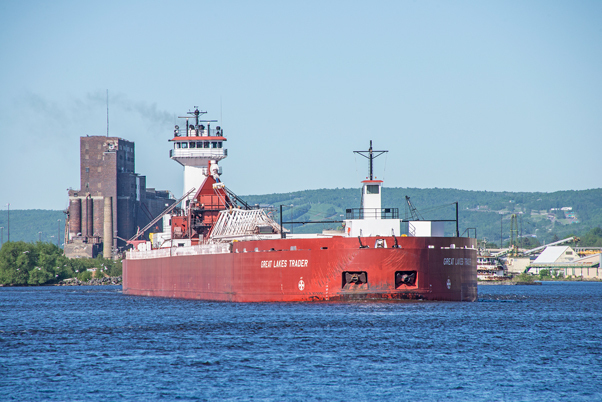 A week earlier I happened to be down at Canal Park when the Baie Comeau arrived in Duluth. The Baie Comeau the last of four Trillium Class self-unloading ships of the Canada Steamship Lines . A week later my wife and I planned to go cross country skiing but it was -10 degrees with a additional wind chill so we decided to kill sometime in the morning by driving around Duluth and Superior looking for possible photo locations in the dock area. Our first stop was Rice’s Point Under the Blatnick Bridge. We walked out onto the old wooden Arrowhead Bridge which sticks out into the St. Louis River and took a few photos. Just as we were leaving we notice a tug boat upstream from Rice’s Point. It seemed to be working around a ship leaving the docks. We walked back to the car and drove to a better vantage point. There were two Heritage Marine tugs, the Helen H and Nels J, breaking ice and helping to turn the Baie Cameau. 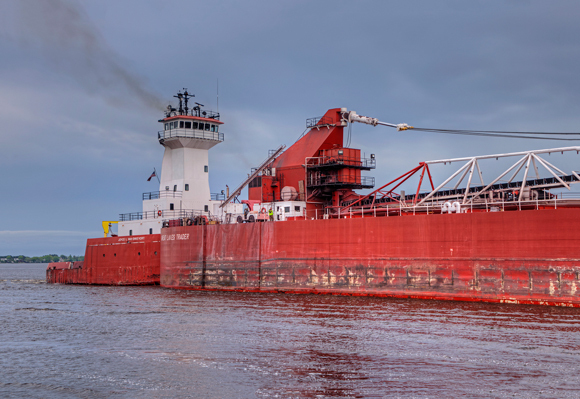 We watched for a while then drove back to the old Arrowhead Bridge where we could get some close-up photos of the tugs and the Baie Cameau as they navigated down the Saint Louis River under the Blatnick Bridge. The tugs were working hard to break up the ice ahead of the ship. We then drove back down to Canal Park to watch the ship exit the harbor and sail out into Lake Superior. It was one of the last ships to leave port. The shipping season ended a few days later.